This monastery was just down the street from us when we lived in Long Beach ten years ago. It has a beautiful view of the ocean and we’d often pass it while out for a walk along the beach. 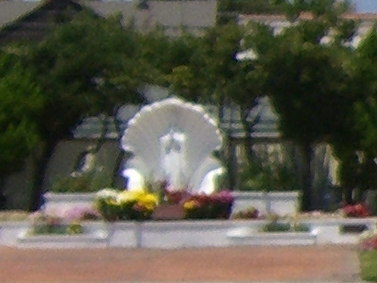 To the left you can see a white shrine in which the Virgin Mary is standing. It is a very pretty installation though we sometimes would call it “Virgin Mary on the Half-shell.” About half the time we’d pass by, there would be someone there, praying to the virgin, or lighting candles or incense. The monastery used to be a convent owned by the Catholic Church, but was long ago sold to a Vietnamese Buddhist sect, and they have converted the building into a monastery for their monks. Every so often you would see one of the monks leave the building in their saffron robes, but for the most part they keep to themselves and maintain a quiet life of contemplation. Now here’s the thing: not only did the monks not tear down the Virgin Mary shrine, but they actively keep it intact, tending to the plants around it, the benches were people come to pray, and bring fresh flowers. I have never asked the monks about why they do this, or if it was a condition of the sale, but they never seem to mind. The Buddhist tradition maintains a very ecumenical respect for the beliefs of others, and maintains that there are many paths to enlightenment. In my personal system of philosophy, I have a name for religions of this type: VALID. A VALID religion is therefore one in which it recognizes other religions as potentially equally valid, and there is no Law of Excluded Middle (as with True/False) that gets in the way. Any religion which declares itself to be the sole possessor of this elusive thing called The Truth, is by my definition INVALID. Alas, this includes almost all religions of the world, including many brands of atheism. This monastery is, then, to me a triple-shrine. First, to the Virgin Mary herself, secondly to the buddhist monks that respect people’s belief in her, and third to the possibility that a religion could if it so chooses become VALID — a thing which seems to me to be the only hope for peace among humans who choose to believe in the wildest of fairy tales. And to date, this monastery represents the only example to my knowledge of a valid religion. I agree 100% with what you said with the exception that links some forms of atheism with religion. Atheism means no beliefs in gods. The fact that some folks use atheism as a mean to force their point of views onto others is not, in my opinion, a form of religion. Active Politicism, certainly. Further, in its highest form, Buddhism has no gods either. It expresses that life is suffering (supported by the principle of entropy), and the use of a moral code which pushes a behavior to make the world a better place for everyone and everything (minimizing entropy). I forgot to add my conclusion that, in my opinion, Buddhism, in its highest form, isn’t a religion, but a philosophy. The problem with the term “atheism” is that it is, philosophically, negative space. That is, an atheistic philosophy is defined by what it does *not* assert, which is to say, a belief in a supernatural deity. I define religion based on its root etymology, namely a set of beliefs in gods or a transcendent super-reality by which a group of people bind together (re – legios). I include in this definition metaphysical assertions which cannot be verified by mathematical, logical, or experimental evidence. By these two definitions the Venn diagram of Atheism and Religion has a non-empty intersection. Buddhism falls in this category as its fundamental belief is in a “Dharma” or a transcendent Law unifying all things and phenomena, but which the unenlightened cannot see and therefore suffer, confused by transient phenomena. What makes it Valid is its tradition of acknowledging “many paths”, by which a person can find enlightenment. I believe that all three criteria you listed, are met in the Christian religion: The bible speaks of the flaws of “religion”, that we only know a small portion of reality/truth/the cosmos, and of the good and truth which comes from “non-believers” and systems external to the Christian faith. Hi Rick, while it is true that Christianity encourages humility in its followers, it does not seem to extend to doctrine. So for example, when it is said in Christianity that Jesus is the way and the light, and that “no man come to the Father but through me” (John 14:6), there isn’t much wriggle room there for alternative paths. You are either saved through Jesus, or you are not saved at all. I will grant that there are self-described practicing Christians such as Freeman Dyson, who profess an ecumenical attitude toward other faiths. But his interpretation of scripture seems far from the mainstream, and requires some extreme stretching of words into unfamiliar shapes. I have some appreciation for Kurt Vonnegut’s “Bokononism” religion, as it flat out admits that every principle it professes is a flat-out Lie. But it points out that these are lies that help you get through life without hurting people, and so are harmless and may do some good. Now that is what I call a humble and potentially valid religion.